In October, you can stop turning on the lights like a sucker and just keep walking. Philips Lighting is adding even more sci-fi-like features to its Hue line of smart lighting. The company just announced a new motion sensor that can integrate with your lights for no-touch activation. 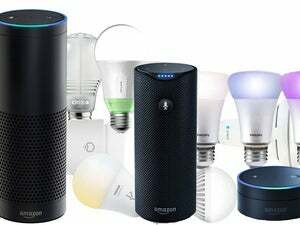 If you walk into a room, the sensor is supposed to detect your presence and turn on the lights in about half a second. The Philips Hue motion sensors will sell for $40 each when they roll out in October. 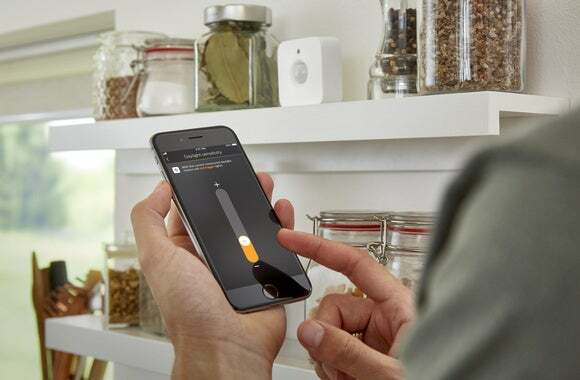 Philips says you can connect up to 12 motion sensors to your Philips Hue bridge, and there’s no complex set-up for the battery-powered wireless devices. The sensors have a detection angle of 100 degrees (vertical and horizontal), and a range around 16 feet, as reported by Engadget in their “hands-on” with the new devices. The motion sensors also come with the ability to detect daylight. If there’s already enough light in the room the motion sensor won’t activate the smart bulbs for you. Adjusting light sensitivity for the motion sensor in the Philips Hue app. 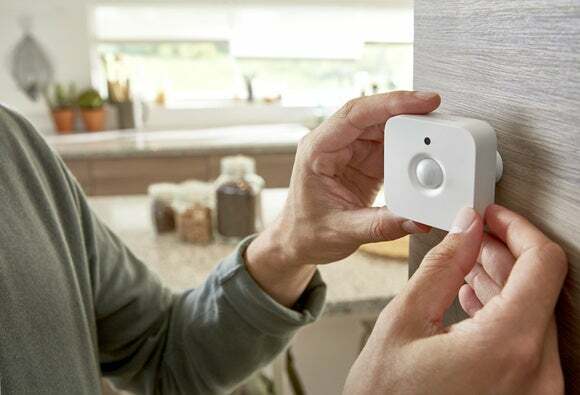 To make sure the motion sensors also don’t leave you in the dark, you can set them to automatically turn off the lights in specific rooms after the sensor fails to detect movement for a certain period of time. You can set a longer period for the bedroom, for example, while the bathroom might have a shorter duration. The lights dim before turning off, too, giving you a chance to wave at the motion sensor before you’re engulfed in darkness. The impact on you at home: Motion sensors for your interior lights have some pretty obvious advantages. No more fumbling for a switch in the dark, for example, or doing the old shoulder switch flip when your hands are full. You just walk into the room or hallway and the lights are on. A motion sensor can also go a long way to keeping unused lighting off when it’s not needed. That in turn saves you the hassle of harassing family members who seem incapable of turning off a light—not to mention a few kilowatt hours on your energy bill.